My version of the Québécois classic Poutine made with sweet potato fries covered in cheese curds and a rich gravy. A number of years ago, I ran off to Montréal over Thanksgiving. My family was’t too happy about this, but I ended up being equally disappointed because I found myself in a place that had celebrated Thanksgiving a month earlier. You see, I am a gravy fiend and will literally drink the stuff right out of the gravy boat when no-one is looking. With mashed potatoes, it’s a perfect meal, and the thought of missing this had me a little heart broken… That is, until I discovered Poutine! I first came across the brilliance of using sweet potatoes in this dish at one of my favourite blogs, Gild the Voodoo Lily. Because the gravy and cheese curds are savoury, using sweet potatoes gives it a nice balance between the savoury and creamy elements. If you’re in NYC you can get fresh cheese curds at Saxelby Cheesemongers, which has a fantastic selection of unique cheeses, but if you’re elsewhere, you should be able to find it at your local cheese shop. Peel and cut the potatoes into 1/4" sticks. Toss in canola oil to coat (don't use olive oil, which has a lower smoke point and will burn in the oven). Sprinkle with some sea salt then lay in a single layer on a baking sheet. Put in the oven and bake for 20-25 minutes or until golden brown. While the potatoes are in the oven, prepare the gravy. Heat the butter in a small saucepan over medium heat and add the shallots sauteing until soft and fragrant. Add the flour and stir to coat. Whisk in the chicken stock and port. Sweet poutine. I have definitely made all the components of this wounderous dish but never together. In fact, I have made the curds from scratch before and they are loads of fun. Seriously. Seems like something you would love to do. As a side note, poutin is so popular is it a common McD’s menu item — not that yours would resemble it in the faintest. Oh, poutine is wonderful–and this almost makes it healthy. Two words (and then some more): Duck. Fat. The name is more than vaguely lewd;) I’ve heard of this stuff–cheese, potatoes and gravy? Sign me up! My hubs would love this! He’s all about gravy! Beautiful. Esp. love the backlit steam coming off the dish in the second picture! i’ve never had (a?) poutine. the recipe sounds lovely, though, anything with gravy sounds good to me!! Poutine is a fine food export from Montreal. I remember Heather’s and yours looks equally as decadent. Sounds delicious, I love sweet potato. 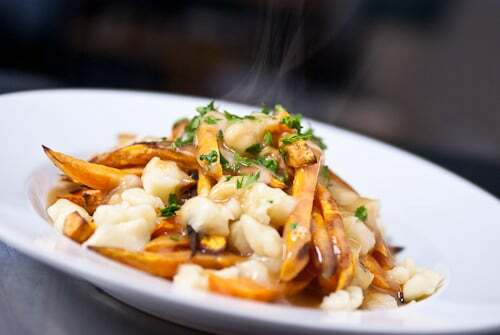 I haven’t heard of this sweet potato preparation before (and I haven’t been to Quebec yet either) – fabulous! Looks delicious! I love your site! Those look to die for! I’m not even a gravy fan and I could fall in love with them! Well done! you know after our fun trip to montreal in october last year, we’ve had poutine on the blog backburner b/c i could not friggin find cheese curds. i was going to make them and never got around to it. THANK you for the tip!!! you’re great for that!! Oh my. Poutine is a fabulous, fabulous thing. I have always thought it strange that in the US it seems chili fries are common, or cheese fries, but not gravy with fries (or at least, not as common as it is in Canada). Photos and recipes like yours will surely change that! Your poutine seems the perfect Sunday brunch companion after a fun Saturday night! Though we’ve never had poutine, we’ve heard it is oh so good. Sweet potatoes are what make this sound even better. Yessss! I live in Montreal, and was actually terrified of poutine when I first moved here. I was sure I would have a heart attack within a week of eating this stuff. However, poutine is an institution in this city, and I have finally succumbed to it’s pure hedonistic fabulousness. I love sweet potatoes much more than the other kind, so this sounds like a safe bet! even though it’s a million degrees outside where we are, this still looks like something I’d devour right about now. Oh my goodness, does that look rich. Poutine is new to me, I definitely want to try it! Your photo with the steam is fabulous! 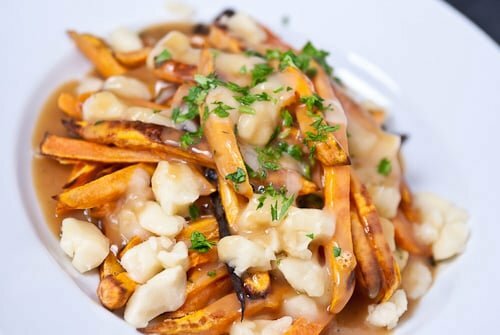 Sweet potatoes work really well in poutine! I’ve never had poutine (and have to admit never even heard of it before) yes I need to get out more often LOL! I’m loving the sweet potatoes in this. marc, think i’m convinced. i love chips. i love gravy even more. i must taste this! !